The "Seven Deadly Sins," a group of evil knights who conspired to overthrow the kingdom of Britannia, were said to have been eradicated by the Holy Knights, although some claim that they still live. Ten years later, the Holy Knights have staged a Coup d'état and assassinated the king, becoming the new, tyrannical rulers of the kingdom. Elizabeth, the king's only daughter, sets out on a journey to find the "Seven Deadly Sins," and to enlist their help in taking back the kingdom. 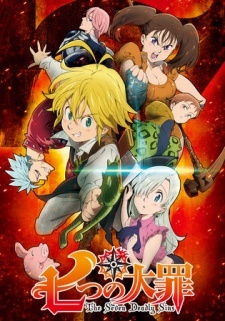 Watch The Seven Deadly Sins Episodes Online at Animegg.org. The Seven Deadly Sins is available in High Definition only through Animegg.org. Choose an episode below and start watching The Seven Deadly Sins in Subbed & Dubbed HD now.